Auroras observed occasionally by Chinese, Greek and Romans. Tycho Brahe observes auroras from his observatory at Uraniborg. Pierre Gassendi observes several auroras in the early 17th century and suggests the name Aurora Borealis. Discovery of sunspots (1609), Maunder minimum of solar activity (1645-1715), the auroras observed only exceptionally. J. J. Dortou de Mairan suggests that the auroral light was generated by a solar fluid impinging upon the Earth atmosphere. First theory based on a relationship between the Sun and the Earth. Olof P. Hiorter observes perturbations of the compass needle during the aurora phenomenon. Together with his chief Anders Celsius discovered the magnetic basis for auroras. Don Ulloa, a Spanish naval, observes a polar light when rounding Cape Horn (56°) and confirms the hypotheses of J. Mairana that polar lights arise in both polar regions. Captain James Cook confirms the auroras in high southern latitudes. Pehr Wilhelm Wargentin concluded from various observations that auroras are observable from different places at the same time and extend horizontally as a belt surrounding the North Pole. 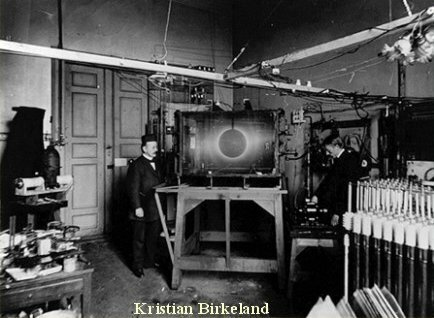 Kristian Birkeland suggests that auroras were produced by electrons ejected from the Sun and guided by the Earth magnetosphere to the high-latitude region. 200 crown Norwegian note. The terrella is deposited in Aurora museum in Tromso. 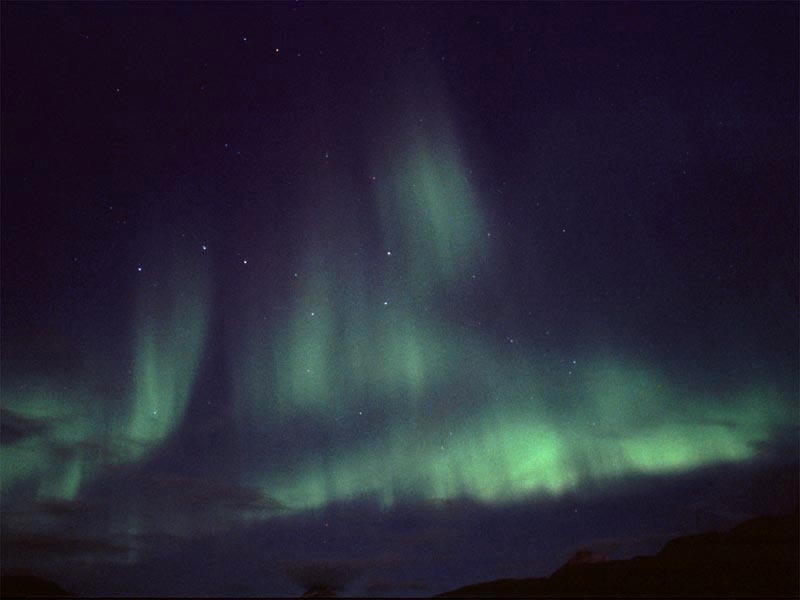 Hannes Alfvén proposes first detailed model of the aurora and magnetic storm phenomena. The current sheaths along the Earth magnetic field are responsible for radiation of excited atmosphere atoms. Seaton and Hunten suggest classification of the aurora intensity based on the number of photons emitted. The scale is nowadays known as IBC (International Brightness Coefficient). Navigation satellite 1963-38C detects currents in the upper atmosphere. Satellite TRIAD measures the currents along Earth magnetic field lines in detail. The maximum of the currents is near 70° latitude. The currents form vertical walls of both directions. served as the basis for the expedition logo. The A. Vallance-Jones classification of the aurora shapes had been established (HA, HB, RA, RB, DS, PS, PA, PC, F). Satellite DYNAMICS EXPLORER I for the first time observes the whole aurora oval. On the March 13th reached the Earth a cloud of charged particles from the Sun. Rapid changes in magnetic field induced electrical voltage which completely destroyed main Quebec transformer. Total collapse of the electrical network involved Canada, Ontario and British Columbia. Local failures were in Pennsylvania, New York and even California. Fantastic Northern Lights twinkled above darkled America. Auroras had been observed on Saturn and Jupiter (HST, STIS). Intense investigation of the auroras from space begins (POLAR, DYNAMICS EXPLORER I, NOAA). Auroras of the same type correspond at the same time in both Earth polar regions. 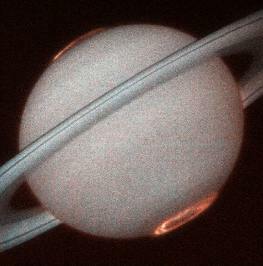 Saturn Aurora, UV region. HST, STIS, 1998. Jupiter Aurora, north pole. HST, STIS. 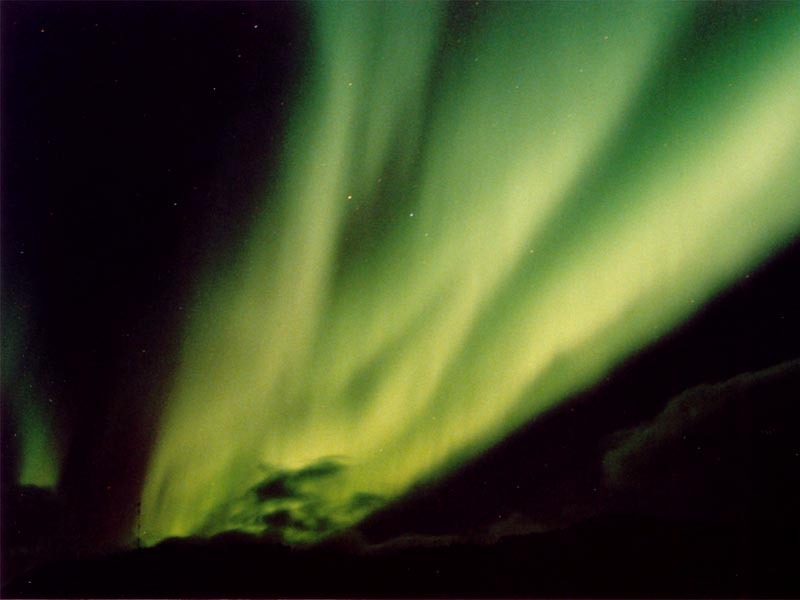 Polar lights (Aurora Polaris) are divided as Northern Lights (Aurora Borealis) and Southern Lights (Aurora Australis). The classification of the auroras from the intensity point of view was introduces by Seaton a Hunten in 1954 (the intensity unit is 1 R - Rayleigh, 106 fotons reaching 1 cm2 during 1 s). The resulting coefficient IBC (International Brightness Coefficient) can acquire the values from I to IV. 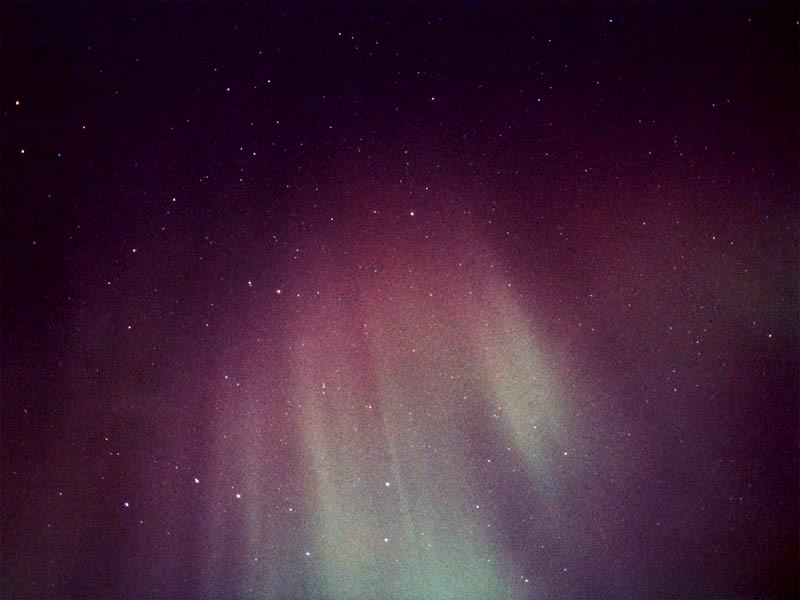 The classification of the auroras from the shape point of view was introduced by Valance and Jones in 1974. The classification includes nine basic shapes. HA Homogeneous Arc Regular form in height, direction and intensity. HB Homogeneous Band Same as HA, but variable along length. RA Rays Arc Same as HA, luminosity quasi vertically structured. RB Rays Band Same as RA, luminosity quasi vertically structured. DS Diffuse Surface Uniform emitting area. PS Pulsating Surface Same as DS, but intensity variable in time (several seconds). PA Pulsating Arc Same as HA, but intensity variable in time (several seconds). C Corona Ray system parallel to the magnetic field lines. F Flaming Forms of variable intensity moving towards zenith. Some of our photographs. Try to class them. Other classification represents Kp index and from it derived activity NOAA index. Both indices are proportional to magnetic field fluctuations from the equilibrium state and the lower geomagnetic latitude limit for possible aurora observation. The geomagnetic pole is shifted with respect to the geographic one towards America and Canada. Prague geomagnetic latitude is 45,5° and so the highest activity degree has to be reached for aurora observations in Prague. Polar lights are known from polar regions of both hemispheres. So called auroral oval is formed near the 70°latitude, the thickness can be 5°. 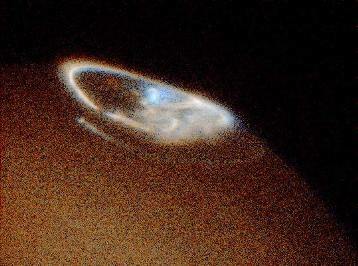 The oval is best visible in UV region from the cosmic space. 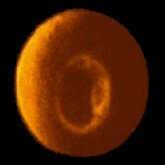 The auroral oval can be deformed in various ways. Its intensity depends on the solar activity. During increased solar activity marvellous polar lights with rich internal structure arise in the vicinity of the oval. Sporadically the polar lights arise in the areas out of the oval, but they have relatively simple structure. From the physical point of view the oval is a region of electric currents flowing along the Earth magnetic field lines. In the right figure you can see the aurora oval in UV region photographed by the POLAR satellite in 1997. 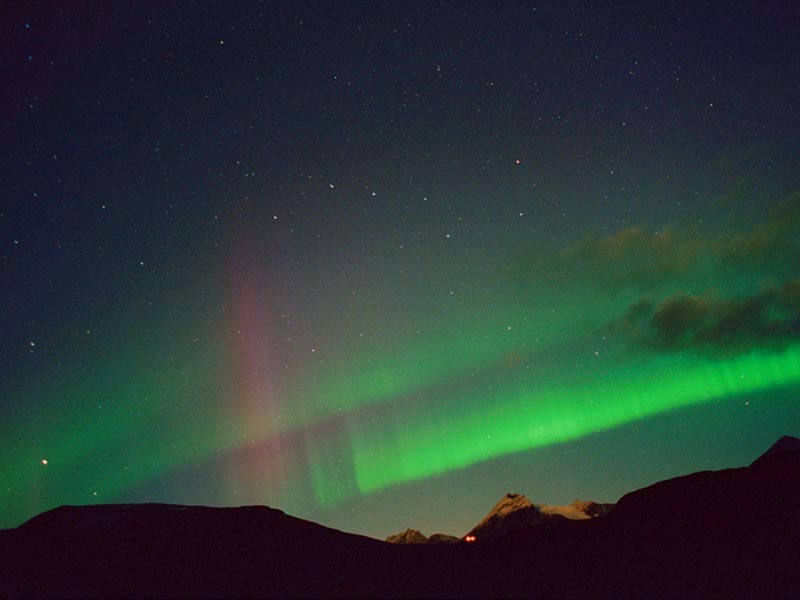 Polar lights are located in the heights from 70 to 300 km above the Earth. The visually observed polar lights are the most-down parts of the current sheaths. The length (horizontal) can reach up to 1000 km. The light wall thickness is several kilometres, maximally about 10 kilometres. The characteristic time of the polar light evolution can be in minutes, for pulsating surfaces in seconds. Sometimes it is possible to watch light waves in the aurora and moving vertical columns. The characteristic colours are green (oxygen), red (oxygen, hydrogen) and blue (molecular nitrogen). The oxygen also radiates in UV region, where the satellite observations are performed. The Sun is a star with variable activity. Both charged and neutral particles move through the Solar System in solar wind. These particles interact with the Earth magnetosphere. Electrons and ions rotate along magnetic field lines (so called gyration motion). The characteristic gyration radius is 200 m for ions and 10 cm for electrons. The protons can catch electron and become a neutral hydrogen atom which does not interact with the Earth magnetic field. Direct excitation. Magnetosphere electrons collide with atoms and molecules of the atmosphere and excite the surrounding bounded electrons: X + e —> X * + e. During subsequent deexcitation the light of some typical wavelength is emitted: X * —> X + g. In dense atmosphere near the Earth surface there is not sufficient time for the deexcitation process. The energy is quenched during collisions to other species. That is why the auroras are observed from 70 km above. Indirect excitation. There is a great number of indirect excitation processes due to the collisions. Let us mention dissociative recombination of oxygen molecule as an example: O2+ + e —> O* + O. As the next step deexcitation of the oxygen atom occurs: O * —> O + g.
Proton collisions. The proton collisions ca ionize hydrogen (lost of the hydrogen electron), ionize molecules or dissociate molecules. Polar lights caused by protons are low intensive (type I) and mostly without internal structure (HA, DS). All these processes are responsible for the light effects connected with auroras. Various deexcitation processes in atoms of oxygen and nitrogen cause mostly green, red and blue auroras. The colour depends on the atmosphere state and on the height above the Earth. Exceptionally yellow auroras can be observed in places where red and green auroras overlap. The most common green colour is caused by the emission line 557.7 nm of the oxygen O(1S).